Hofbrauhaus can be enjoyed by all. Music can be found playing at different times throughout the day. If the beer hall atmosphere is too busy for you there is a more personal experience waiting for you on the second floor in the smaller Bräustube. Hofbrau’s popular wurst sausage is made fresh every morning at 4 am to be ready for famous beer and sausage breakfast that is served every day. I can personally say this something not is missed. Family travel tip: Hofbrau is very kid friendly. You will find families and children in the venue at all hours of the day. The kids were very interested in how the waitresses could carry so many beers at once and the traditional ompha music. As mentioned earlier Munich is at its heart and sole a beer town. Many people visit Munich especially just for the beer, Beer halls and beer Gardens, No article on Munich is complete without introducing you to the major players in the Munich Beer Market. Paulaner – Paulaner was founded in 1634 in Munich by the Minim friars of the Neudeck ob der Au cloister. Paulaner ranks number six among Germany’s best selling beers. The Paulaner Hefe Weissbier is AMAZING! Lowenbrau – Löwenbräu is alleged to have been founded around 1383. Löwenbräu beer has been served at every Oktoberfest in Munich since 1810. Augustinerbrau – Augustiner-Bräu was founded in 1328, it is Munich’s oldest independent brewery. Augustiner’s. most popular beer is Augustiner Helles. Spaten – First mentioned in 1397. Its most popular beer is the Munchner Hell. Its one of my favourite Munich pale ales. Franziskaner – Makes wheat beer and the best wheat beer at that. There Dunkel, dark wheat beer is a must. Hacker Pschorr – formed in 1972 out of the merger of two breweries. Hacker brewery was first mentioned in 1417. Hofbrau – is owned by the Bavarian government. Founded in 1589 by the Duke of Bavaria, Wilhelm V to serve as the royal brewer. Today its most popular through its Hofbrauhaus premises worldwide. Munich Sightseeing – Marienplatz, Munich City Centre, Town Gates. Munich city centre is a great place to stroll around in the summer. There is plenty of cafe’s, restaurants and bars. Beer is a big thing in Munich and it is available everywhere. There are a plethora of amazing churches to be viewed. If you are a fan of the Swan King Ludwig you will find his tomb in one of these such churches. Neuhauser Straube runs from Munich Karlsplatz to Marienplatz. It is the main pedestrian mall and filled with shops of all design. The world famous glockenspiel at Munich Rathaus re-enacts two stories from the 16th century to the mass of tourists waiting patiently for the show. It consists of 43 bells and 32 life-sized figures. Every day at 11 a.m. (as well as 12 p.m. and 5 p.m. in summer) it can be viewed. 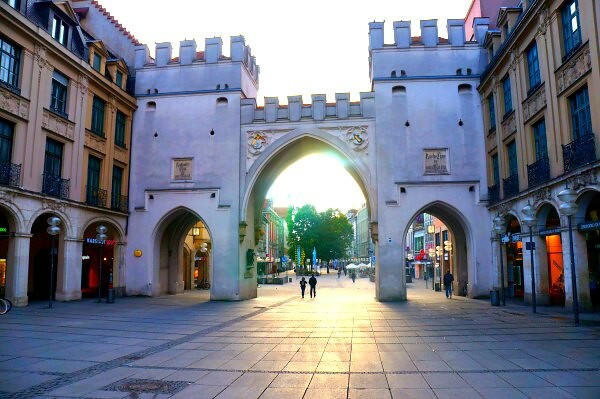 Munich has three original town gates left Karlstor, Sendlinger Tor and Isartor. All three town gates can be viewed within the city centre region of Munich. These town gates were built during the 13th century as part of a defensive wall to protect the city. I love Karlstor its picturesque with a fountain and leads down Neuhauser Straube. I love Isartor with its painted images of Louis the Bavarian (Ludwig IV) after this victory over the Austrians at the battle of Ampfing in 1322. I love Sendlinger Tor because of its simplicity and how one would imagine a town gate from the middle ages would look. BMW Welt is a burst of narcism from this German auto giant. It is everything the BMW group creates, constructs and sells all in the one place. BMW welt would cause heart palpitations among car lovers and even arouse a sense of recognition among us all. BMW WELT displays all the BMW models, a world that pays homage to the Mini and even the iconic Rolls Royce that BMW now builds. You can hire a BMW for a cruise or just sit in the many models and dream. You can tour the factory or buy entry to the museum. Motorbike’s, BMW merchandise and concept cars abound. I am not a car lover but BMW started my engine. We spent over 2.5 hours here looking, sitting, photography the cars. Best of all this attraction is free to visit, yes free. Family travel tip: BMW has a junior campus for kids to learn key consepts. There is cafe’s and a restaurant. Free wifi and comfy couches to have a rest between sitting in cars and climbing on Motorbikes. Weisswurst – White veal sausage you will find everywhere. They even serve it for breakfast. Leberkässemmel – Basically a meatloaf sandwich served warm with mustard. Any of these dishes will be found throughout Munch and Bavaria. The Bavarian cuisine is hearty and filling. Great Munich food will be found all through the city. There is over 4 km of track through the park where you can observe the Bavarian animals in their natural habitat at Wildpark Poing. The animals are penned in big and natural enclosures. We are not talking a small Zoo enclosures here we are talking big natural simulated environments for these animals. I these enclosures they can roam and have some resemblance of what their life in nature would look like Wildpark Poing is a great way to spend an afternoon outside of Munich. I hope you can find something interesting to visit in our article. I did not list Oktoberfest as it only happens for 2 weeks every year. By all means, if you can attend it amazing and highly recommended with or without kids in tow. You can read about out Oktoberfest experience here. Make sure you put Munich on your list of cities to visit you won’t be disappointed. You will be most rewarded if you get a little out of the city centre. I must say we always love visiting the beer halls and beer gardens while in Munch. They are a must do in Munich. Hackerhaus – Sendlinger Str. 14, 80331 München, Germany. A traditional Bavarian restaurant of the historic Hasker-Pschorr brewery, with wood-panelled decor & classic dishes. Augustiner Bräustuben – Landsberger Str. 19, 80339 München, Germany. The Bavarian restaurant of the venerable brewery, with wood-panelling, classic dishes & draught beer. We have personally eaten at all these venues and would highly recommend a visit and a meal for a more authentic Munch food experience. It looks amazing, what a great experience for the kids (and you)!! Have you seen the surf wave in the English garden? This would be my favorite spot. Munich is my favorite city in Germany ! I’ve never been to Munich, but i have a cousin who traveled around Europe and said Munich was hands down one of his favorite places. His rave review was enough to convince me to visit! I only visited Munich once, but I was impressed. I came away wanting to live there! I was struck by how beautiful and well-kept all the parks are. Lots of late-opening beer gardens too! Great post. 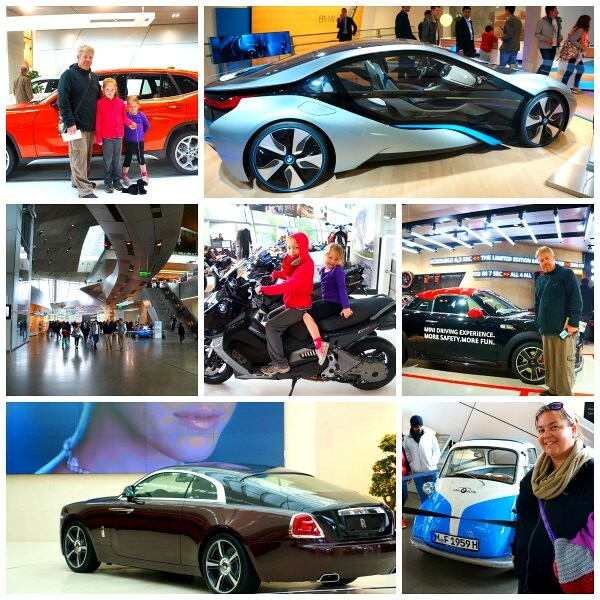 Our boys loved the BMW Welt! Did you do the tour? Just got back from Munich. I wish I’d seen this post before I left on the trip! Oh well… one of my coworkers suggested visiting Schloss Nymphenburg and I’m so glad I did. The expansive park and gardens were so tranquil and a lovely spot for a pre-work walk. Thanks for sharing! I actually went to Munich when I was about 18 but I can’t remember it at all (maybe I drank too much of their famous beer!) – shame, it looks fab! I particularly like the look of the Hofbrauhaus – I will definitely add that to my list. We live just a few hours from Munich, so go often. I agree that Hofbrauhaus is one of those “tourist musts.” After taking people there, I ALWAYS take then to the Augustiener though. Way more authentic, better food, better prices, wonderful beer garden…w/out all the tourists! We’ve yet to do Munich so this is incredibly useful- especially the family friendly tips..! I didn’t know that much about Munich, but looks like we have to plan a visit to this city. I know the feeling you get when you arrive a city and immediately feel at home, Rome is our city! The Deutsches Museum does sound like something we would like, and the other half of WTT would probably love the BMW Welt. Thanks for sharing! I didn’t know much about Munich but from your post I can tell that it’s a great city! 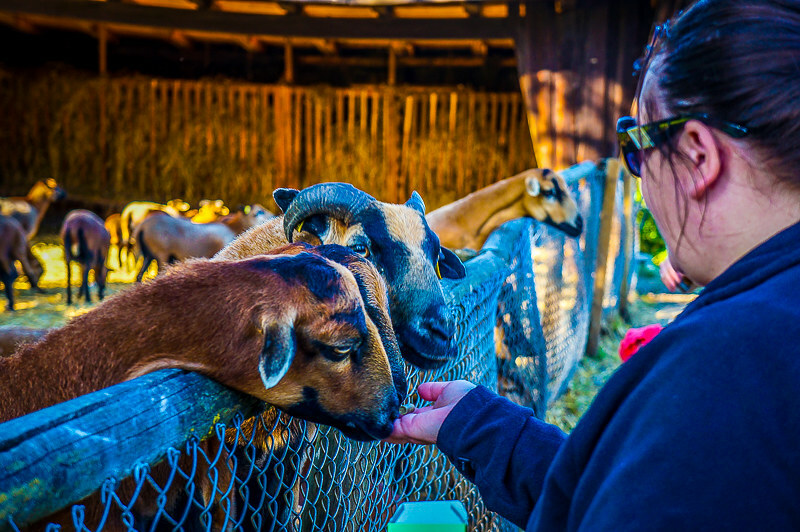 Looks like you and the family had a great time and scouted out the best things to do in Munich. I’d love to go to the HofbrauHaus! I’ve not been to Munich but the historic architecture would be a huge draw for me, I love strolling through a city with my camera. And who can fault a city known for its beer and sausages. This just reminds me of my trip to Munich. We enjoyed the beer halls although the beer mugs were bigger than my head. It was 3Litres I believe. It was fun though. Munich looks wonderful through your photos. My husband, daughter and I will have to make a point on visiting very soon. Between the Pork knuckles, schnitzel, sausages, and the Hofbrau House, we are so hooked. You had me at sausage! Munich has been towards the top of my list for must-see European cities, but we have yet to make it there. Octoberfest sounds fun, but might be a little too crazy for me. I would rather relax in Hofbrau House, enjoy a Munich lager and maybe a pork knuckle! I really need to get myself to Munich. I love visiting Germany but have never been. Really want to visit the Hofbrau House! Munich looks amazing. I’ve never been but I’m hoping to get there in time to catch the end of Oktoberfest this year! I can’t wait. I keep hearing good things about it and in a way it looks much more beautiful then Berlin for example where almost everyone going to Germany goes. The museum looks very interesting. My daughter, her two children 8 and 11 and I will be in the Munich, Stuttgart and Heidelberg area for appx 3 days. We will be traveling in rental car. I need some “must dos”. I am enjoying the Blog and the extremely helpful information, which of course makes me want to do it all. Do you have abbreviated suggestions (lol) for area?